In 2017 America, we have access to countless narratives of people existing and surviving under oppressive conditions, be they social, psychological, or political. In my own life, I’ve read Soviet writers who worked in the USSR as well as Western writers who visited the USSR and wrote about their experiences and observations afterward. I was reminded of this today when I saw in The New York Times an article by Margaret Atwood entitled “Margaret Atwood on What The Handmaid’s Tale Means in the Age of Trump.” In this article, Atwood talks about her novel and its setting: an America which has gone through a coup that establishes a strict patriarchal rule based in 17th century Puritanism. Under this oppression, human rights, especially women’s rights, are minimal if they exist at all. Only “the elite,” i.e. those in power, have human rights and freedoms. They dominate and control everyone and everything else. Atwood wrote this story in 1984, during the Reagan era in America. It was in 1984 that I first met Evan Quinn, the protagonist of my Perceval series, and began to explore who he was and what his story was. Since the November 2016 election, I’ve been thinking about the role of the writer in a society that is hostile toward the arts, especially literature, and is obsessed with money. Commerce rules in America, and there’s nothing sweeter than gigantic profits. The sign of success? Your income level, earned, or especially, unearned, as in investments. If you are a member of the Working Poor, you are not a success according to American society. The number of writers in the top 1% income group are few. Most writers fall somewhere between the Working Poor and the middle Middle Class. And no, I don’t have specific statistics on that, just what I’ve observed in Minnesota which is an active literary area in the country. For the last 2 months, we’ve seen a new president and government that wants to keep writers either subservient to them or silent. They’ve acted to destroy the press, calling various media news outlets “the enemy of the people.” They’ve acted to cut federal government support of the arts by defunding and abolishing the National Endowment for the Arts and the National Endowment for the Humanities. This government doesn’t like writers. Why? For the same reason the USSR’s government didn’t like them. And I know that I may be making a controversial comparison here, but please bear with me (I’m not making the Nazi comparison because it’s redundant). The Soviet government established rules and bureaucratic procedures by which every citizen had to abide, except for the ruling elite who enjoyed all the power and perks. Writers observed life in the Soviet Union and how this system affected that life and they wrote about it. And many were “disappeared” because of it. The government tried to corral writers into a governmental structure called the Union of Soviet Writers which was created in 1932 by the Central Committee of the Communist Party. If a writer gained membership in the Union (and the Communist Party), he enjoyed financial support and publication. If a writer was not a member, he enjoyed poverty and being banned from publication. Members of the Union had to adhere to the Party’s Socialist Realism in all their creative expression. In this way, the government controlled what the writers wrote. I’m a bit surprised that the Bannon-Trump government hasn’t thought about merging the National Endowment for the Arts and the National Endowment for the Humanities into one artist union with departments for literature, painting, music, dance, etc. (In the Perceval novels, it’s called the Arts Council.) Perhaps they haven’t yet thought of it, or maybe they have and have concluded that it would be a waste of money since they believe the arts are not very profitable but dangerous to them. What should American writers do right now and going forward? As always, write the truth as you experience it. Whether in nonfiction or fiction, writers need to continue doing what they do best: observe, witness, reveal, and be clear and true in all of their words. In the April 2017 The Writer, Gail Radley (“Through the Looking Glass”) writes about what facts are and how to find the truth. She’s comprehensive in talking about the internet, trusted sources, and how to tell when a website is not to be trusted no matter what it looks like. Her tips could also apply to government websites masquerading as private websites. Write to resist. Write to witness. Write to record for posterity, whether in a fictional format or nonfiction. If you have activism running through your blood, protest and demonstrate non-violently, peacefully, and meaningfully. Keep it simple. Writers know how to reveal character through dialogue, right? Use that skill to actively communicate to your elected representatives or when you are protesting in a group. I know, I know. All this sounds rather paranoid. Perhaps it is. But I do think that those in power right now are truly serious about what they want to accomplish. Those who disagree with them, anyone who wants to insure the arts will be available to anyone and everyone forever, all need to be just as serious and determined in what they want to accomplish. Writers: How do you think of your readers? Writers need readers. We want to share our stories with other people, and it’s a bonus if those people respond to what they read and let us know what they think. We already know that our first relationship with a reader occurs on the page, so it’s important to tell the best story we can, written the best we can write it. Whether you write poetry, scripts, freelance features, nonfiction, memoir, or novels, your goal is to touch minds with a reader. And if the stars align, and you write like an angel, you connect with many readers, making them think you are of like souls. Think of yourself as a reader, and remember that special book that touched you once upon a time. The author reached across the void with characters, storytelling, and voice, and made you believe they understood you as a human being. The author deemed you credible, and you felt the same in return. This is where I part company with Hope Clark: when I’m reading, I’m not thinking that the writer has understood me personally as a human being. I think that the writer was successful (or not) in illuminating some universal truth of the human condition. Maybe it’s because I’m a writer, but I don’t think the writer of the book, short story, or article I’m reading is writing to me specifically. I know when I write, I’m writing for myself in actuality, to satisfy the need to express myself and share the stories my imagination gives me. The internet has given writers a tool with which to connect even more easily with their readers. It gives us a way to value our readers, appreciate them, communicate with them, and learn from them, in addition to meeting readers face-to-face during book tours. The internet also gives readers a place to meet and talk about books, e.g. Goodreads. I love hearing from my readers! 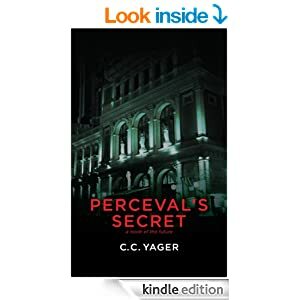 I wish more people were reading Perceval’s Secret and using the internet to communicate their reaction to it, whether directly to me via e-mail or at this blog, or in reviews posted at Amazon, B&N, or Goodreads (or elsewhere). Hope Clark cautions in her note that writers write not for sales or Facebook likes, but for that “intimate” relationship with our readers. I would add that I write to experience my intimate relationship with myself and my imagination, and to explore human behavior. Why do you write? How do you think of your readers? Do you want to be famous? I’ve been asked this at times when a person I’ve met finds out I’m a writer. Or a variation is the statement, “Oh, I bet you’ll be famous someday.” These comments make me cringe inside. Plus, they rarely include any mention of money, remuneration for my writing, or becoming wealthy as a result of my writing. There is a truth of this world: fame and fortune rarely visit writers, whether that visit is short or long, or they’re together. From the beginning of my writing career in elementary school, I’ve known that I didn’t want to be famous in the Hollywood sense, i.e. a celebrity. What I’ve wanted is to be known. That is, known as a writer who tells good, entertaining stories, a writer who is worth a read, a writer who’s worth following. I’ve wanted my writing to be known, also, not just me as a writer. For me, the writing is the most important thing and I wouldn’t mind if it were more famous and known than I was. I do not want to be a writer celebrity. I cherish my privacy, my solitude for writing, my anonymity. I believe these things are essential for a writer to be able to work well and effectively. I admire those who have been made into celebrities and they continue to write, amazed that they found the way for themselves to work around the intrusions of their celebrity. Maria Popova, at her blog Brain Pickings, wrote an article about John Steinbeck and his response to his fame. While reading it, I thought again about my own thoughts on fame, and how much sympathy I felt for Steinbeck’s frustrations with fame. He complained how often people equated fame with wealth, and that fame did not equate to wealth at all. Unless, of course, it was a wealth of frustration, loss of privacy and of time to write, as well as a wealth of people showing up and asking him for money. No surprise there. In American society, we define success in terms of making money. So of course people would assume that Steinbeck had made a lot of money because he was very successful. But writers cannot define success in terms of money like the rest of the world. I believe writers need to define success in terms of wealth of readership, fans, and then there’s actually finishing a book or story, then getting an agent to represent it, then having a publisher publish it. These are all successes. Some relate to money to a certain extent, but it’s more about the acceptance of the work than the sale of it. Yes, we love what you’ve written and we want to support it, publish it, insure that it reaches a lot of readers. Why do they think a writer, just because he can write, will make a good after-dinner speaker, or club committeeman, or even a public speaker? I’m no public speaker and I don’t want to be. I’m not even a finished writer yet, I haven’t learned my craft. Like any true writer, he resented the outside demands on his writing time. He was frustrated. I’m amazed that he managed to finish The Grapes of Wrath during this time. Then that novel became a bestseller, feeding his fame, and just making the PR machine even louder and more insistent. Steinbeck, like any writer, was grateful to get paid for his work and to no longer be poor. But he wasn’t grateful for the fame and PR machine. Know what you want. Know what your intent is. Know what you’re getting into if you want to be famous, I say. Otherwise, it will consume the innocent with destructive glee. Or better: be careful what you wish for, you may get it…..
Years ago, Joseph Campbell and Bill Moyers riveted my attention with their series The Power of Myth. I listened carefully to Campbell. His love for his subject gave his words power and excited me. He talked about “following your bliss” which is the same as your soul’s desire. I knew that my bliss was writing stories, exploring the mysteries of the human condition and behavior through fiction. Then in one segment, Campbell talked about artists and their position in a society, their role in passing on the stories of myth. Especially writers whom he referred to as “shamans,” or holy people. Writers are the stewards of a culture’s myths. Are writers today the shamans of our culture? Who are our shamans, the stewards of our culture’s myths? Do we even know anymore what our culture’s myths are? Do we care? The word shaman conjures images of magic, indigenous people, mysterious rituals, fire and mist. A shaman has access to the supernatural whereas traditional clergy of most of our religions are grounded in the physical world. Our religious clergy have a hierarchy of power to which they adhere along with rules and regulations that govern each religion. Shamans tend to be independent contractors who abide by the laws of the Universe, as they see it. Magic often plays a prominent role in a shaman’s work. We can easily imagine our traditional clergy as scholars and writers — many have been. But could we imagine a shaman as a writer? I believe this is an especially important question right now because of the social upheaval we’re seeing in our culture. When I think about writer-shamans, the first name that pops into my head is John Lennon and his song Imagine. In this song, Lennon focused more on imagining positive images after identifying what needs to be changed. He kept it simple, giving the song power in its straightforward words. Lennon understood that it wasn’t enough simply to identify what’s wrong. It was necessary to use the imagination to create images of the positive changes that will replace what’s wrong. For the life of me, though, I cannot think of any novelists or poets who I could elevate to shaman status. Writers who explore social change have traditionally written in the science fiction and fantasy genre where they can set their stories on other planets or worlds to gain distance from earth’s readers and their sensitivities. The last few years, dystopias and apocalyptic scenarios have dominated this genre to a certain degree. Does that mean that we are expecting the worst? Or does it mean that we need to be reminded even more to use our imaginations to imagine positive futures for ourselves? I’ve just finished reading a novel written by a possible shaman: Walter M. Miller, Jr. His novel was A Canticle for Leibowitz. After a nuclear war that destroys earth as we know it, there’s a social backlash against political leaders and intellectuals, scientists and anyone else who was involved in creating the conditions that led to the war, and the knowledge involved. But the physicist Leibowitz understands that someone needs to protect and preserve human knowledge for the future when people will be ready to learn it again. The overall theme of this novel is the question: Can humans learn from their mistakes and not make the same mistakes again? Miller explores how humans think, what’s important to people in the future, religion and spiritual influences (not always the same thing), and the social changes that occur over time. I think this is the work of a shaman-writer because of the depth of the exploration, the hard questions Miller poses, and his honesty and integrity in telling the story. It’s not as optimistic as I think writers would create now, but it thoroughly examines humanity and the issues we face now as well as the possible issues we’d face in the future. Who else could be a writer-shaman in the present? Are there any bestselling novelists who would qualify? Not one idea for a post this morning or even yesterday or the day before. I want to write something. But my head is full of life concerns, not literary concerns. How do I, as a writer, deal with this? Frustration. I’m actually more concerned about which book to take to read in the hospital. I cannot make up my mind. From past experience, I know that it’s impossible to get into a literary novel. Genre stories are better. So, I’m looking at mysteries and science fiction. On the mysteries side: P. D. James because I haven’t read her in years and I have a couple of her books already. A friend has offered a Jo Nesbo mystery, and I’m intensely interested in reading his work. On the science fiction side, I’m considering a novel by Charles Stross. I’m also toying with possibly taking We by Eugene Zamiatin. I’m already taking the wonderful magazine Fantasy & Science Fiction so maybe a mystery would be better. Hospital reading is highly personal. What to read when you’re not feeling all that great? In the past, I’ve taken a Kathy Reichs mystery, a literary mystery that I could not get into and still have not read, a Janet Evanovich mystery that was also quite funny, and magazines like The Atlantic, The Writer, and Granta. Sometimes general interest magazines are really the best bet. They’re easier to read in small chunks and go with the flow of constant interruptions. Sometimes, though, I’ve not wanted to read anything. In that case, I’ve watched TV for hours and hours. The hospital has cable TV — I do not. I remember being really surprised that now cable TV channels run commercials. I thought the whole point of paid television was NOT to run commercials. What a disappointment. During one hospital stay, I discovered the delightful and very funny show Monk on cable. It was the perfect antidote to that particular hospital experience. This time, I am taking my Sony Walkman which also has a radio, and a few CDs. I want to see if music has a beneficial effect on my experience. I am also taking my Falun gong (qigong energy exercises) with me to do when I’m able to stand for longer than five minutes. What about writing? Well, I am taking a notebook and pens, and my pocket calendar in which to note events. I discovered during my last post-op hospitalization, that morphine does not enhance writing but makes it physically more difficult to do. I wrote very slowly and dozed between words. My handwriting also was barely legible. Eventually, when I wasn’t on the morphine anymore, my writing improved and I wrote more. Hospital stays are ironic, actually. You expect to sleep a lot, rest in bed, not do much, right? Well, that’s not really the case, at least for surgical patients. I expect that I’ll be roused out of bed early the next day in order to stand and walk a few steps. By evening of the first day, I expect to have walked at least five times and be able to walk on my own to the bathroom and back. There are a LOT of interruptions — lab techs for blood draws, nurse assistants to check vitals, doctors with their residents, physical or occupational therapists to start you on the exercises to help build your strength so you can be discharged eventually, volunteers with offers of magazines or conversation, and so on. And the welcome interruptions of friends visiting. And look at this: I’ve written nearly 600 words about topics related to writing that deal with my upcoming hospitalization. There really is truth to the saying to just write even if your head is empty….